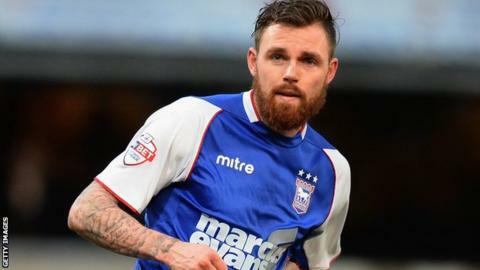 Ipswich kept themselves in the hunt for the Championship play-offs by easing to victory over lacklustre Huddersfield. Paul Anderson curled in an early opener for the visitors before Daryl Murphy poked in a second midway through the first half. Huddersfield rarely threatened, with Oscar Gobern having their first shot on target late on with an effort that Dean Gerken saved with his legs. Ipswich are eighth with 61 points, two points off sixth place. Huddersfield, meanwhile, are 17th and seven points clear of the relegation zone with five games remaining. Ipswich attacked from the outset as Murphy twice went close before Anderson opened the scoring in the sixth minute. The winger found space on the edge of the area and curled a beautiful effort beyond Huddersfield goalkeeper Alex Smithies. With Huddersfield unable to assert themselves in the final third, it was left to Ipswich to take up the attacking initiative and they added a second when a corner was only half cleared as far as Murphy and he made no mistake from close range. Danny Ward shot wide for Huddersfield following a promising move, but it was Ipswich who still looked the most likely to score as Anderson forced Smithies into a one-handed save. Huddersfield improved as the second half progressed, with Gerken finally tested by Gobern, but it was too late to deny Ipswich victory. "Whatever team we put out on Saturday we need to work. The whole tradition of this club is based on hard work but tonight it seemed there were too many players who thought they could turn up and play without putting any effort in. "The players know exactly how I feel and they now need to respond. There comes a point where the players have to take responsibility and grow up. "We looked like we were a team of individuals and we were blaming each other and that must be eradicated quickly. If I could have made 11 changes I would have." "It shows we have a good team spirit and work ethic. "We were beaten by Blackburn and had to travel home and then back up to Huddersfield and there was a danger we could get another slapping. "That didn't happen and we had a top response from the lads." Match ends, Huddersfield Town 0, Ipswich Town 2. Second Half ends, Huddersfield Town 0, Ipswich Town 2. Oscar Gobern (Huddersfield Town) is shown the yellow card for a bad foul. Attempt missed. Sean Scannell (Huddersfield Town) left footed shot from outside the box is just a bit too high. Corner, Huddersfield Town. Conceded by Tommy Smith. Attempt blocked. Tom Smith (Huddersfield Town) right footed shot from outside the box is blocked. Assisted by Adam Clayton. Dangerous play by Nahki Wells (Huddersfield Town). Attempt saved. Oscar Gobern (Huddersfield Town) left footed shot from outside the box is saved in the top centre of the goal. Substitution, Huddersfield Town. Harry Bunn replaces Daniel Ward. Substitution, Ipswich Town. Anthony Wordsworth replaces Stephen Hunt. Attempt missed. Daniel Ward (Huddersfield Town) left footed shot from a difficult angle on the left is too high. Assisted by Anthony Gerrard following a set piece situation. Attempt missed. Anthony Gerrard (Huddersfield Town) header from the right side of the box misses to the left. Assisted by Adam Clayton with a cross following a set piece situation. Hand ball by Tommy Smith (Ipswich Town). Foul by Tom Smith (Huddersfield Town). Attempt blocked. Nahki Wells (Huddersfield Town) left footed shot from the right side of the box is blocked. Assisted by Duane Holmes with a cross. Stephen Hunt (Ipswich Town) is shown the yellow card. Duane Holmes (Huddersfield Town) wins a free kick on the right wing. Jonathan Williams (Ipswich Town) wins a free kick on the left wing. Offside, Huddersfield Town. Adam Clayton tries a through ball, but Sean Scannell is caught offside. Substitution, Ipswich Town. Tyrone Mings replaces Aaron Cresswell because of an injury.